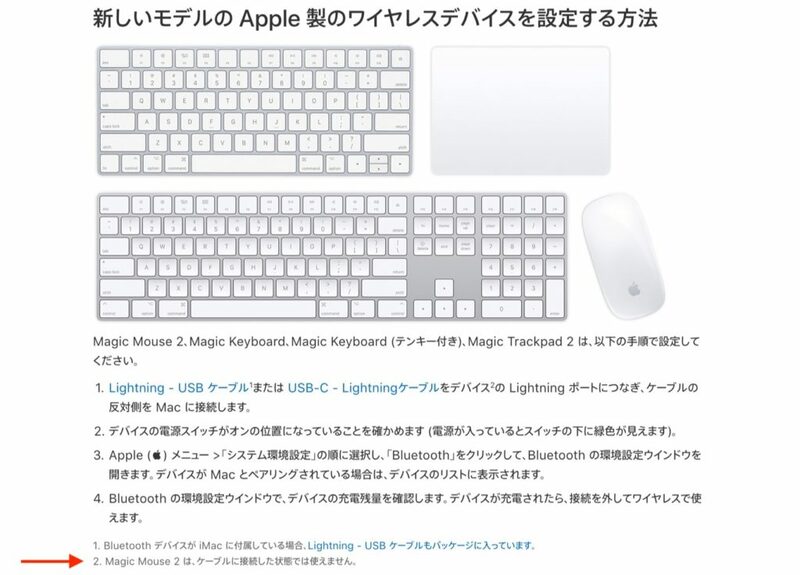 新しい「Magic Keyboard」および「Magic Trackpad 2」はLightning接続でUSBキーボードやマウスとして利用可能。 | AAPL Ch. Those Lightning cables are used to recharge the accessories, but they’ll also carry data when connected to your Mac. This obviates the need for separate wired and wireless versions, since any wireless accessory effectively becomes a wired accessory when you plug it in (that said, the placement of the Lightning port on the bottom of the Magic Mouse 2 makes this impractical). Now, the interesting part/surprise: I noticed my Bluetooth-connected symbol wasn’t on when I had the cable connected, and yep – suspicions confirmed. This is a 100% WIRED keyboard when the Lightning cable is connected to the computer. I was able to turn Bluetooth off on my iMac, and the keyboard kept working. Very nice!